F/A-18A Hornets from 75 Squadron have taken over air combat operations over Iraq from 1 Squadron’s F/A-18F Super Hornets, Defence has announced. The six single-seat F/A-18A ‘classic’ Hornets deployed to Al Minhad Air Base, near Dubai, in early March, and have since been conducting familiarisation flights prior to taking on full operational responsibilities for the RAAF’s air combat operations against Islamic State in Iraq under Operation Okra. “In addition to individual pilot and weapon systems officer hand-overs, all related supporting personnel have been ‘briefed-in’ and are now fully operational,” Defence said in a statement on Friday. “The last two weeks have been a particularly busy period for the [Air Task Group] with the current Super Hornet rotation continuing to perform missions together with the new strike element,” Air Task Group Commander Air Commodore Glen Braz said. The six Super Hornets will now return to Australia, but the date of their arrival home at RAAF Base Amberley won’t be disclosed, Defence said, due to “operational security reasons”. During their seven months of operational flying over Iraq, the 1SQN F/A-18Fs flew over 400 sorties and 2,900 flight hours. 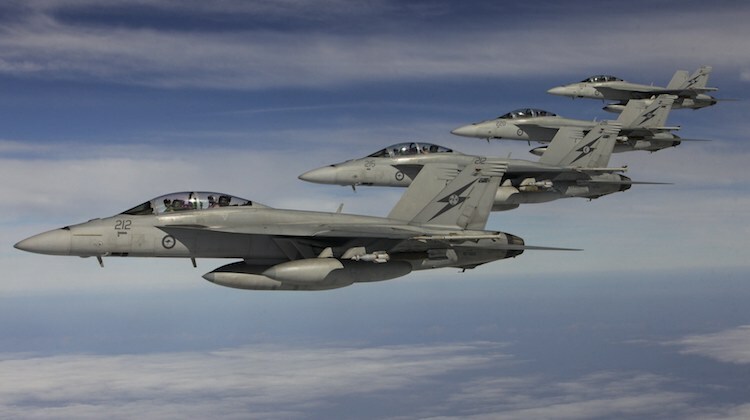 The RAAF intends to rotate through its three operational ‘classic’ Hornet squadrons and one operational Super Hornet squadron on six monthly deployments for however long the government wishes to continue operations over Iraq. “The idea at the moment is to give each squadron probably six months,” Chief of Air Force Air Marshal Geoff Brown said in an interview published in the March issue of Australian Aviation. Regular rotations also ensure fast jet crews don’t lose too much currency in air-to-air skills and minimise disruption to the squadron’s training program. Smart move, the classic hornet is still capable of performing this role. It also is better because keeps the flight hours of the super hornets down.